We're really starting to notice them, aren't we? If less than 10% of your e-commerce sales come from mobile devices, you're serving the traditional baby boomer generation (Judy). If more than 25% of your e-commerce sales come from mobile devices, you're likely serving a much younger generation (Jasmine). All of the hype you read about (mobile, social, local, big data) serves Jasmine. Some of the hype you read about (omnichannel) serves Jennifer. Almost nobody pays attention to Judy anymore, except for companies that are generating 10% pre-tax profit by marketing to her. They don't care what the pundits say, they just enjoy running a profitable business. Nobody's business model is "dead" ... the next five years are going to be about identifying a customer audience, then catering to that audience. The biggest differences are now generational in nature. Yes, I get it, a 27 year old sometimes shops catalogs, and that 59 year old sometimes pulls out an iPad at an airport to purchase smoked salmon. Holistically, however, it's a generational deal, and we as marketers have to pick who our target customer is going to be. We can't be "omnichannel", because individual customers are not "omnichannel". Omnichannel is what we see when we average Judy, Jennifer, and Jasmine. I probably get more questions about the square root rule than anything else I talk about, aside from Gliebers Dresses. 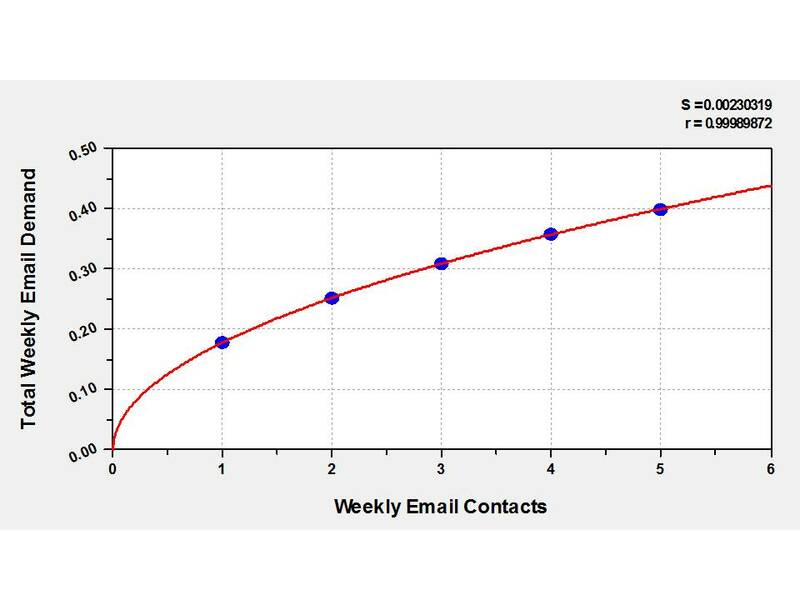 Pay close attention to the sales generated by about one email campaign per week ($0.18), and the total sales generated by about five email campaigns per week ($0.40). This relationship is approximated by the square root rule. 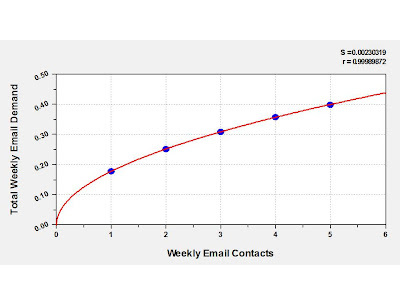 If you know that you generate $0.40 in email demand per week by sending five campaigns per week, you can guesstimate what might happen if you send other combinations of campaigns. 1 campaign per week = (1/5)^(0.5) * $0.40 = $0.18. 2 campaigns per week = (2/5)^(0.5) * $0.40 = $0.25. 3 campaigns per week = (3/5)^(0.5) * $0.40 = $0.31. 4 campaigns per week = (4/5)^(0.5) * $0.40 = $0.36. 5 campaigns per week = (5/5)^(0.5) * $0.40 = $0.40. Now we can easily calculate the incremental impact of each contact. 2 campaigns per week = (2/5)^(0.5) * $0.40 = $0.07. 3 campaigns per week = (3/5)^(0.5) * $0.40 = $0.06. 4 campaigns per week = (4/5)^(0.5) * $0.40 = $0.05. 5 campaigns per week = (5/5)^(0.5) * $0.40 = $0.04. Clearly, the "right" answer is to actually test the right number of campaigns. Unfortunately, so few people execute frequency tests that few people even understand the concept of incrementality. So if your business leaders won't allow you to test the optimal contact frequency because of some odd excuse like "we can't afford to lose sales", then use the square root rule as a proxy for testing. By the way, the square root rule works really well on estimating the budget for non-branded paid search terms. You probably grow tired of yelling at your merchandising and marketing teams about the performance of your business. Or your inventory team for doing a miserable job of forecasting item-level demand. Or your creative team for abandoning well-performing imagery for fashion-forward shots. This week, take a break from your usual victims, and ask your merchandising team to illustrate, by month, the percentage of sales that come from new items. Define new items however you like ... there are many choices. 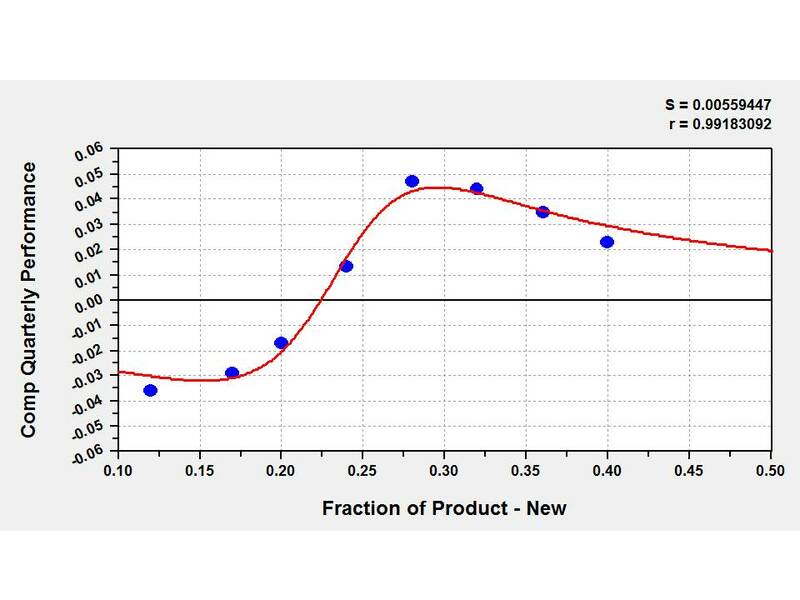 You want to correlate the fraction of sales from new items with your current level of business performance. When this business has less than 27% of merchandise sold in the "new" category, sales begin to slide. Interestingly, when 33% or more of merchandise sold is in the "new" category, sales also begin to slide. Customers are clearly telling this brand the "right" mix between new and existing products. Have your merchandising team correlate your new/existing mix with comp quarterly sales. See if there is a merchandise development problem that can be addressed. Conversion Rate = Orders / Visits. This works well, until you're a retail brand. In retail, the website (and email campaigns) are used as research tools to facilitate retail purchases. I like to analyze conversion on a monthly basis. It gives us a better representation of actual customer behavior, and it clearly illustrates the importance of a website or mobile experience. Here's a sample retail brand, evaluated on a monthly basis, within only the e-commerce channel, for a segment of customers. Customers at the Start of July = 22,394. Re-Visit Rate, Month of July = 60%. Actual Visits per Visitor = 4.00. Purchases per Customer = 0.60 * 4.00 * 0.05 = 0.12. Now, it's nice to know that the average customer in this segment placed 0.12 purchases in the next month. It's nice to know that 60% of the audience was "engaged", as the kids like to say. And it's nice to know that those who were engaged visited the website weekly. That's all good. Purchases per Customer = 0.60 * 4.00 * 0.20 = 0.36. Fraction of Orders, Retail = 75%. Fraction of Orders, Direct Channel = 25%. Web Analysts have an opportunity to link retail and website activities. Just because one is a "digital analyst" doesn't mean you only measure "digital" activities. No, you need to measure reality! And for retail-based businesses, 75%ish of purchases, +/-, happen in-store. It makes sense to illustrate just how important a website is at generating in-store purchases. The first lady is Judy. She's around 59 years old, and her behaviors tend to be "old-school" ... she buys via catalogs, and while she embraces new technology, she primarily shops via habits derived in the 1980s and 1990s. The second lady is Jennifer. She's around 43 years old, and her behaviors are hard to "attribute". She hunts online for the best products at the best prices, touching many marketing channels. The third lady is Jasmine. She's around 27 years old. Her behaviors are not consistent with Judy and Jennifer. Social and Mobile are part of her entire adult experience. We can analyze online customer behavior via each persona. Here's a query I recently ran ... segmenting customers as of June 30, 2012, measuring online visit behavior from July 1, 2012 to July 31, 2012. Each persona represents weighted life-to-date transactions for twelve month buyers. 3.568 monthly visits per visitor. 4.387 monthly visits per visitor. 5.220 monthly visits per visitor. Notice that Jasmine is far more "engaged" than Judy or Jennifer. Judy is much less likely to visit the website, and if she visits, she only visited 3.6 times in July. Jasmine, meanwhile, is 50% more likely to visit than Judy, and will visit every 5-6 days. Judy is more "purpose driven" than Jasmine, converting at a much higher rate. Jasmine, however, because of her high likelihood of visit regularity, buys much more often online. This is something the conversion optimization gurus sometimes miss ... we want Jasmine's behavior, but we optimize for Judy's behavior. This is exactly opposite of what we should do. We want more visits at a lower conversion rate, if the net result is a significant increase in total purchases, as it is in this example with Jasmine. It's been an amazing couple of years. In that time, you invented terms like "omnichannel" and "big data". Both terms require each other, and therefore, require the purchase of research reports, attendance at conferences, and finally, expensive software installations that require consulting services to retrain employees who spent a lifetime dealing with "small data". All of these purchases and services benefit the omnichannel advocate. You frequently follow a compelling narrative. You present a complex array of customer behavior, one that seems almost unmanageable. You present us with a customer possessing nearly limitless sophistication. She begins with search, visiting websites, conducting research. Or maybe she receives a catalog or a personalized and highly relevant email campaign that drives her to a website. Regardless, our intrepid customer, with considerable time and resources at her disposal, eventually drives to a store to physically look at merchandise. This is a key inflection point in the purchase process. In the old days (2010), the customer would buy something in-store. But in modern times (2012), the customer "showrooms", she pulls out her mobile device, browsing for cheaper prices and social media reviews, dodging retargeting strategies by competing retailers via display ads. With luck, the customer chooses an omnichannel brand utilizing big data to "be everywhere" the customer is. At worst case, the customer buys from Amazon, an outcome more devastating than the customer buying nothing. The narrative ends with a terrifying view of the future, one where "brands" that fail to adopt an omnichannel framework are destined for the scrap heap of history, destined to become the next Montgomery Wards, while Amazon continues an unstoppable rampage through the commerce landscape. When you mix big data and fear in a marketing blender, you get "omnichannel". Most important, you put the reader at a knowledge disadvantage. The poor reader works at Ann Taylor, he certainly isn't leveraging big data, and even though his business is profitable, he is, according to the narrative, failing miserably, and is just a few years from being out of business. He only possesses a series of legacy reports that are downloaded into Excel, reports that only tell him what sold, and when it sold. He can't possibly see that his customer is researching alternatives on Facebook. He has no idea that a competitor is offering a comparable product at 20% off. His search reporting is terrible. His direct mail efforts are feckless. His marketing efforts are in silos across the company, not coordinated, not integrated, not effective. He's about to lose market share to Zappos, a division of Amazon. He'll be out of business in three years. Everything he does has been pronounced "dead". The reader is told that this problem can be solved by being "omnichannel". I have a few questions for you, the omnichannel advocate. You promote an omnichannel strategy. And yet, Amazon is anything but omnichannel. Amazon is not "social" in the way that Best Buy (Twelpforce) is social. Amazon is not in retail. Amazon does not leverage offline advertising in a scalable way. Amazon does not leverage direct mail in an effective way. But Amazon is systematically crushing companies that leverage various elements of the omnichannel strategies proposed by omnichannel advocates. How do you explain the fact that Amazon essentially does the opposite of your proposed strategy, and easily defeats companies employing various iterations of your strategy? And you can't answer "they avoid collection of sales tax", since brands that are forced to collect sales tax after being tax-free rarely see a measurable drop in sales once sales tax is collected. How do you reconcile the fact that you believe customers are "omnichannel", and yet, when you actually mine customer data, the majority of customers have a single-channel preference that doesn't often change? Have you actually done the analysis, or are you reciting survey data from research organizations? Discuss. What proof do you have, today, that a "brand" that fails to adopt an omnichannel strategy will be out of business in the near future? Please provide simulation results that demonstrate how Ann Taylor or Chicos will be driven out of business, soon. In fact, if you provide links to the simulation results in the comments section, I will publish your simulations in a future blog post. How do you explain companies like One Kings Lane, who go from $0 to hundreds of millions of dollars in annual sales in just a few years, by employing discount-based curation strategies that are largely independent of the omnichannel strategies you demand retailers participate in? One can make a strong argument that One Kings Lane operates independent of the omnichannel strategies folks are proposing. Do you have a case study of a business employing an omnichannel strategy, one that yields a sales increase over two years of several hundred million dollars? This year, JCP changed a pricing strategy, and saw sales drop by 15%. In other words, we know that pricing strategies are critically important to the customer. If pricing strategies account for a +/- 15% change in net sales, how much do your omnichannel big data simulations suggest that omnichannel strategies impact net sales? 0%? 2%? 12%? 22%? 32%? 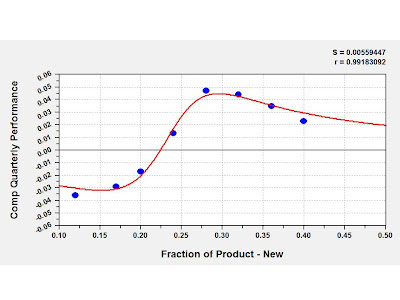 Please show the data that illustrates or is used to simulate the sales increase you estimate. You claim that "showrooming" is a huge problem. Have you stood in a Best Buy store and physically calculated the percentage of customers who pull out a mobile device and actively showroom in the store? Have you segmented those who actually perform this activity by age cohort? In the comments section of this post, please publish your findings. You consistently claim that "best customers do everything", and therefore suggest that best customers are omnichannel, and then make the leap of faith that if a retailer becomes "omnichannel", the retailer will cause average customers to become more likely to behave in an omnichannel manner, like best customers behave, thereby causing unfettered sales increases. Please show the data mining results and/or simulations that demonstrate that a once-a-year buyer will become far more likely to spend more if the retailer advocates an omnichannel strategy that appeals to best customers. Please provide a link to your research in the comments section of this blog post. If you were going to start a business from scratch, today, would you start a business with a fully integrated omnichannel strategy that includes direct mail and websites and social media and mobile and retail stores and online marketing, or would you start with a merchandising concept employed within limited channels (Amazon, Zappos, One Kings Lane, eBags, Chasing Fireflies)? If your instinct suggests the latter, why do you advocate the former? Explain how Apple, with no tangible social media strategy, outperforms companies that fully leverage a social media strategy in the spirit of the ominchannel framework you advocate? If your answer is "product" or "merchandise", then why shouldn't businesses prioritize product over channel strategy? You frequently advocate an integrated marketing/merchandising/creative organization, where all decisions are made by a centralized organization, providing one coherent representation of the brand. You frequently advocate the elimination of what you call "silos". Prove that your style of organizational structure leads to a healthy increase in annual sales and profit, and provide links to the case studies or simulations that demonstrate that your ideas lead to a 10% or better annual sales increase. Describe why retailers must integrate all marketing activities within one department via the elimination of silos, but your organization frequently operates within the context of silos (sales, marketing). Why is your organization allowed to have silos, but the solutions you sell require the client to have full integration of marketing activities? Yes, I understand, there's a lot of data, and when it is braided together across fifty channels, you have the potential for a wonderful CRM-fueled situation where a customer tweets about a problem with an iPad and seconds later a vendor provides a solution to the customer. But that capability existed four years ago, in real time. And that capability existed thirteen years ago in email, just not in real time. Why do you believe the customer demands that this capability exist as part of a seamless experience, and you believe that during the multichannel era the customer also demanded a seamless experience, and yet, for more than a decade, the promise has not been realized? The technology existed. The customer allegedly wanted it. Why didn't it happen, and why do you think it will be different this time? We were told 5-10 years ago that retailers would be out of business if they didn't employ multichannel strategies. Most retailers did not employ multichannel strategies as advocated by the vendor community, and survived nicely. And companies that did employ multichannel strategies (Borders, Circuit City) are out of business. Please reconcile these inconsistencies, and then discuss if similar inconsistencies may exist for retailers who do/do not employ omnichannel strategies. Furthermore, if there are other reasons that cause businesses to succeed/fail, how important are those reasons in comparison to being "omnichannel"? Should the retailer focus on other issues instead, if resources are limited and other issues provide a greater return on investment? You demand that email be part of an omnichannel strategy, and advocate that "email relevancy" is a critical step in the success chain. When was it acceptable for email marketing to not be relevant? 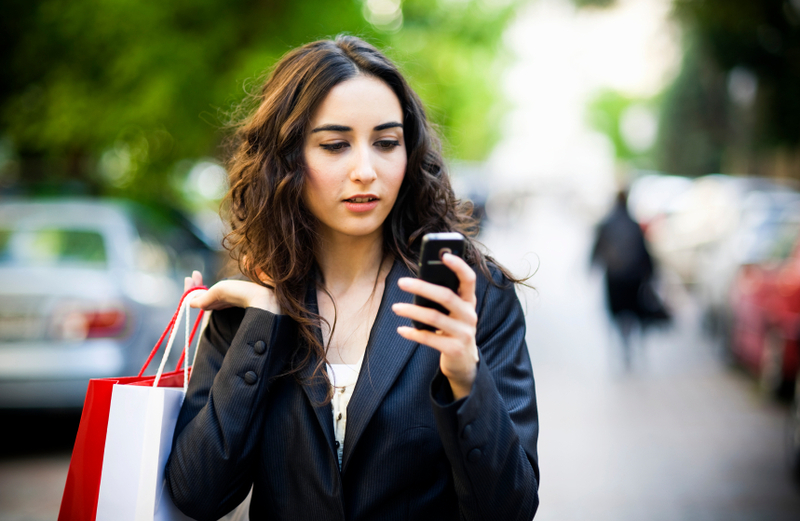 We keep hearing that social media is a huge component of big data and omnichannel. And yet, unless you're a startup catering to an under-30 audience, social media never accounts for more than a couple of percentage points of annual sales, total. Please explain why social is a critical component of an omnichannel strategy, when 95% of businesses with sales over $20,000,000 generate almost no sales whatsoever from social media, even those who apply all possible best practices to the craft? Catalogers were told they had to become "multichannel" or they would die. They became multichannel. They were told that catalogs drove orders to other channels. However, by keeping the catalog "in the mix", most catalogers maintained their traditional audience and as a consequence, did not relate to a younger audience. Today, most catalogers have an age discrepancy that disconnects them from the average consumer, now catering to a 55+ rural audience. Since omnichannel is just an extension of multichannel, are you advocating a circumstance that will cause companies employing an omnichannel strategy to eventually serve an older-than-average customer? Does your strategy potentially damage the customer files of businesses that employ an omnichannel strategy, given what we already know about the evolution of the catalog multichannel customer? Often, multichannel advocates use campaign results to prove that integrated omnichannel marketing campaigns work. However, annual results (repurchase rate, orders per buyer, items per order) seldom change. How do you reconcile the fact that your omnichannel campaigns change weekly customer behavior but do not change annual customer behavior? And if omnichannel campaigns do not change annual customer behavior, then why employ them? The promise of "big data" in an omnichannel framework is that artificial intelligence will detect customer behavior unseen by humans, thereby eliminating the "gut feel" and "instinct" that historically drove business success. And yet, the artificial intelligence that is used in a "big data" framework is not fundamentally different from the artificial intelligence used for the past twenty years by "small data" practitioners. Why do you believe that the same methodologies that have been largely ignored by non-geeky business-focused individuals for twenty years will suddenly be embraced by non-geeky business-focused individuals within a big data framework? Of course, omnichannel is important. I am asking you to separate the importance from the facts that prove it is important. Please provide proof in the comments section. And by proof, I don't mean a Woodside Research report projecting what the world will look like in 2016, and I don't want the results of a one-off campaign executed over a two-week period of time in late 2011. I want actual proof, or the simulations that lead to the possibility of proof. If you're defending omnichannnel/big-data, then you are a data person, so go get the data!!! I will publish credible responses on this blog on Wednesday morning. Read this article (click here). Here's the second article (click here). Or this one from Bain Capital (click here). Here's a fourth article (click here). A fifth article (click here). A sixth article (click here). A seventh article (you have nothing better to do today, so just read it). In the comments section, please outline your definition of "omnichannel". Please outline the expected amount of annual profit gain a business should expect from a highly coherent omnichannel strategy. Where possible, cite a case study of a business that generated a significant annual (not campaign) sales and profit improvement due to an omnichannel strategy. Tomorrow, we'll consider whether it even matters to be "omnichannel". If you're in the Bay Area, and you have a few free hours over lunch on August 22, why not join me for a discussion about Judy, Jennifer, and Jasmine ... your three favorite ladies??!! The Direct Marketing Association of Northern California is putting on a nice luncheon on August 22, don't you think? (Click Here for Details). You'll learn plenty from Kathi Kaplan (VP at VMWare) and Kim Hansen (VP at TravelSmith), making your nominal investment pay off. 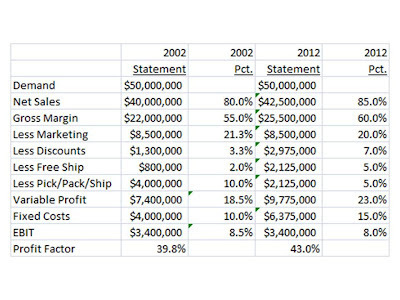 Have you recently looked at how your profit and loss statement evolved over the past decade? 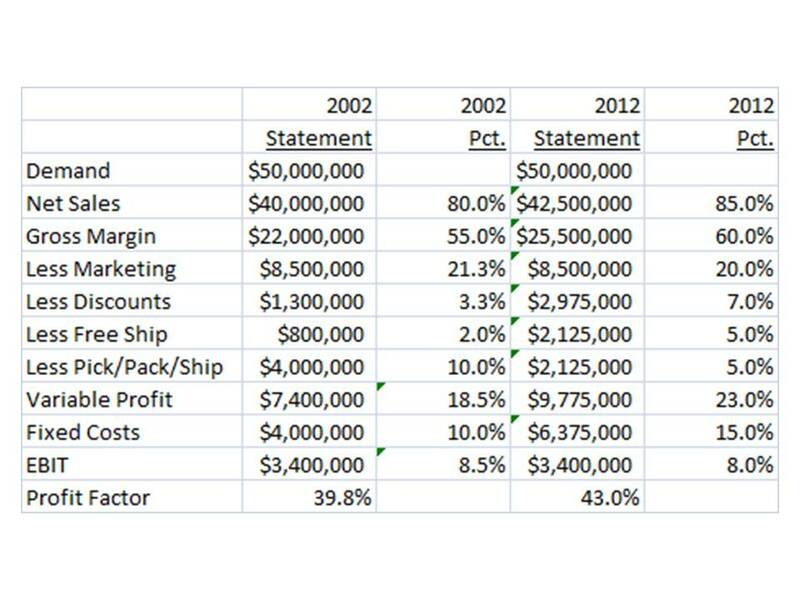 I look at a metric called "profit factor". It's the rate, excluding marketing expense, that demand (what a customer wants) flows-through to variable profit (before fixed costs). In 2002, we weren't as good at fulfilling merchandise. We're far better at doing that today. In 2012, we've artificially inflated our gross margins, and we give the gross margin back via discounts and free shipping. In response to folks like Amazon or Zappos (now the same company), we either increased prices and gave discounts/free-ship, or we kept prices flat, cut expense out of the product, and then gave discounts/free-ship. Finally, costs have come out of the distribution center. It costs less, today, to pick/pack/ship merchandise than it did ten years ago. In 2002, 39.8% of demand flowed-through to variable profit. In 2012, 43.0% of demand flows-through to profit. Also look at that fixed costs line. I increasingly observe that the fixed costs to run a business have actually increased. I know, this sounds contrary to what you popularly hear, but that's what I am seeing. I don't have a handle on it. In some cases, increased technology costs seem to get passed into the fixed cost line. But when it comes to the profit factor, there are significant ramifications to improved profit factors. For instance, in 2002, a marginal customer generated $2.00 per catalog. Profit = $2.00 * 0.398 - $0.80 (book cost) = Break-Even. Today, a drop in productivity can be easily offset by an improved profit factor. Profit = $1.84 * 0.43 - $0.80 = Break-Even. I keep hearing a phrase ... "we have to find efficiencies, so that we can maintain the buyer file". Loosely interpreted, this might mean "we have to find efficiencies, so that we can keep marketing to customers". The p&l can only take a limited amount of cutting. To improve profitability, either productivity has to increase, or marketing has to decrease. The catalog business model requires sales decreases if marketing decreases. So this doesn't sound like a way to growth. And yet, the new business models we read about are fueled by, as our friend Glenn Glieber would say, "free marketing". In other words, we're reaching a theoretical limit on the amount of improvement we can get out of the profit factor. Without productivity improvements, marketing is next up on the chopping block. As you know, Gliebers Dresses is a fictional business story about a catalog company balancing profit from old-school business models with the need to move into the future. If business fiction is not your thing, then move along, there's nothing to see here. Otherwise, please enjoy the latest installment. Glenn Glieber (CEO): Ok, folks, it's time to get started ... Roger, what are you doing? Roger Morgan (Chief Operating Officer --- he's busy scrolling through a message on his smart phone ... Roger puts his right index finger straight up in the air ...): Shhhhhhhh, one minute. Glenn Glieber: Did I just get shushed? 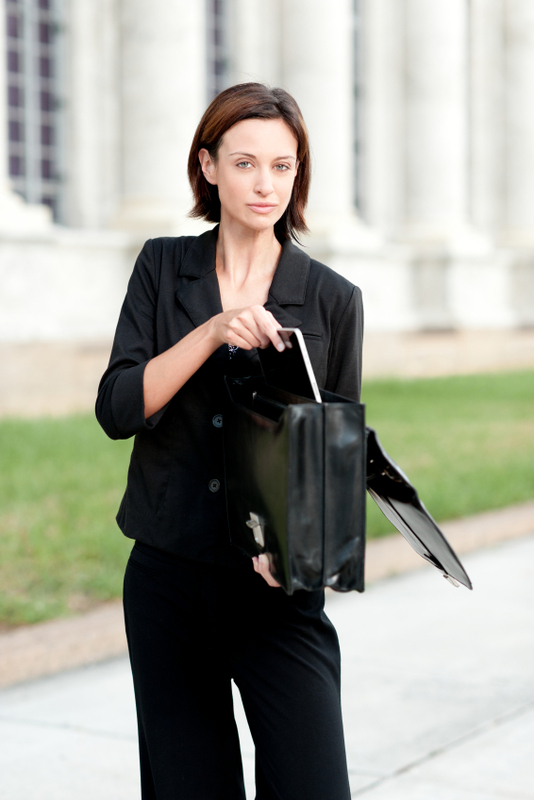 Meredith Thompson (Chief Merchandising Officer): Our Sleeveless Suiting Sheath is really moving this week, and it's at a wonderful price point, just $64.99. Roger Morgan: Can you believe this? Chip Cayman just added "Omnichannel" to his skills. The guy is a genius, always one step ahead of everybody else. Lois Gladstone (Chief Financial Officer): Did he just send you an email, Roger? Roger Morgan: No, I'm busy reading my LinkedIn updates. They are filled with a veritable bounty of actionable information, curated specifically for the active business executive, like me! Lois Gladstone: How do we know that Chip Cayman has Omnichannel skills? Did he get a certificate after attending a conference? Roger Morgan: I'm sure he has ample Omnichannel skills. Why would anybody overstate their skills on LinkedIn? Meredith Thompson: You can say whatever you want to say on these social networking sites. I've looked at Roger's profile on LinkedIn. It says he is a marketing expert. Roger Morgan: Look at this. Beth Whidbey just uploaded a new profile photo. She colored her hair. She's really attractive! Maybe I'll ask her out. Pepper Morgan Pressley (Chief Marketing Officer): Hey Potsie, see if she wants to share milkshake with you at Arnold's? Meredith Thompson: Didn't we block LinkedIn, Facebook, and Twitter from employee computers? And Roger, aren't you the one who runs IT? Didn't you demand that we block social media applications so that employees wouldn't waste precious company resources? Roger Morgan: I'm using my personal phone. I can do whatever I want. Lois Gladstone: Nobody at Gliebers Dresses gets to do whatever they want. Roger Morgan: It isn't 1995, folks. It's 2012. I have to keep up with the times ... Oh oh, look at this, Chip Cayman is now connected to Beth Whidbey. I hope they're not dating. Pepper Morgan: There's nothing more romantic than exchanging Omnichannel skills over a glass of Mogen David Concord Grape wine at a Best Western hotel bar. Roger Morgan: Look at this factoid ... 24% of my network switched jobs last year. Holy cow! You can even click on the image of a person who changed jobs, and see what they are now up to. Let's drill down on what LinkedIn has to say about Beth Whidbey. Glenn Glieber: Roger, how are LinkedIn updates going to help me sell more dresses? Roger Morgan: As the folks at LinkedIn like to say, my network may provide me with connections that further my professional growth. Meredith Thompson: The only time people want to connect with me on LinkedIn is when they are looking for a new job. There's like a 1 in 2 chance that the person connecting with me will be in a new job in sixty days, and won't speak to me again until looking for another new job in 2015. Roger Morgan: Oh oh, look at this. Chip Cayman just asked "the community" a question ... listen to this one ... he asks "will brands who fail to achieve a strategic Omnichannel framework even be relevant in 2014?" That's a great question! What do all of you think? I vote "no". Pepper Morgan Pressley: I know what I'd like to vote on. Roger Morgan: Here's another update from Chip Cayman. He's prolific. He says that, according to Woodside Research, mobile is poised to capture up to 77% of customer mindshare by the year 2015. Lois Gladstone: It's captured 77% of our mindshare in this meeting. Glenn Glieber: How are LinkedIn updates going to help me sell more dresses? Meredith Thompson: As best I can tell, LinkedIn helped us realize that Beth Whidbey dyed her hair, Chip Cayman doesn't have an active consulting project, and Roger circumnavigated his own IP address block of social networking sites by bringing a cell phone into this meeting so that he could dazzle us with the man crush he has on Chip Cayman. Roger Morgan: You folks don't get it, do you? Wait, here's another update. It's from Dr. Gene Feldman. It says "I'm sitting in a meeting right now while everybody debates the relevancy of LinkedIn. We should be discussing how we can sell dresses. Nobody wants to address the elephant in the room." Pepper Morgan Pressley: Roger is the elephant in the room, right Doc? Dr. Gene Feldman (Vice President of Global Brand Direction): As fall turns to winter, the sparrow prepares by building a sturdy nest. But each time the sparrow flies by a maple tree, the sparrow admires the beauty of the fall leaves. Red. Orange. Yellow. The sparrow pauses. Although the beauty is mesmerizing, it is fleeting. The sparrow loses precious time needed to build the nest. Winter closes in on the sparrow. Roger Morgan: Look at this one. Bill Swanson posts "The 5 Slam-Dunk Fail-Safe Ways To Leverage Facebook For E-Commerce Riches". Are you telling me that an article with a well-written subject line won't help us turn this business around? Lois Gladstone: How many connections do you have on LinkedIn, Roger? Roger Morgan: 17,493. But I'm still waiting for Obama and Mitt Romney to accept my invitation to connect. Meredith Thompson: You spent time at work trying to connect with politicians? Roger Morgan: According to LinkedIn, if you factor in connections three degrees from me, I'm potentially connected to 1.6 billion people, so Mitt Romney and I are virtually connected anyway. Meredith Thompson: You're virtually besties. Roger Morgan: You think that somebody in a potential network of 1.6 billion people couldn't help us turn this business around? I mean, when it comes right down to it, if I do my job well, then we have 1.6 billion people potentially generating free marketing for us. Pepper Morgan Pressley: This is crazy. What are we doing here? We've spent the past several weeks talking about being Omnichannel, about the third-degree connective value of LinkedIn, and about Engagement. We talk and we talk and we talk. We don't actually do anything. We sound strategic. Oh, if we could just engage the customer, everything will be fine. Or, if we could only harness the magic of an Omnichannel world, we'd be rolling in profit. Enough, already! Roger, do something, don't become absent in yet another aspect of your life. Roger Morgan: Go mail more catalogs and pretend it is 1993, Pepper. The operations guy shouldn't have to come up with all of the innovative ideas. I'm just trying to help. Pepper Morgan Pressely: You had a year as CEO. You needed all of the help you could get. Roger Morgan: Look at this. Larry Miner just posted an update. He says Apple missed their earnings estimate. First time in nine years. He thinks that they're headed straight into the garbage dumpster. I think I need to join the conversation! Pepper Morgan Pressley: I met this dude at a conference. He spent a half-hour talking about how Amazon was achieving "scale", how they were going to dominate commerce. But when I asked him how Amazon would impact his business, he had no idea. In fact, he couldn't tell you anything about his business. He knew everything about the rest of the marketing world, but he couldn't tell you anything about the marketing he was accountable for. It was like he was plugged into The Matrix, not knowing his own body was being harvested for electricity. Roger Morgan: Evie Chancellor wants to know if anybody uses the LinkedIn InMaps professional networking feature? Oh, that's some sweet action! You get to see your whole network in one big infographic. It's like a big spider web. And isn't that the moral of the story? We're all connected. Meredith Thompson: You're right, we are all stuck in your spider web of Omnichannel connectedness. Glenn Glieber: Well, we need to honor our meeting guidelines. The guidelines state that we have to end all meetings at least five minutes before the top of the hour, so that everybody can get to their next meeting on time. It's been a stimulating hour, folks. Think about what we learned today? Meredith Thompson: We learned that Beth Whidbey colored her hair. Maybe she needs a new dress to match the color of her hair. Lois Gladstone: See, LinkedIn can generate sales!